With the ever increasing popularity and ease of internet access it is now so much easier to have access to positive, inspirational materials of all kinds because it is not filtered through main stream media. As you awaken to your Divine nature you also begin to change your views on life and the importance of things that you previously just accepted as normal. Many years ago I used to feel uninformed if I didn't read the newspaper every day and watch the news, but once I began to understand the Law of Attraction I gave them both up (along with watching soaps) and as time has passed I have filtered even more negative inputs into my life. I used to enjoy watching action movies and thrillers, but now I do not watch anything with more than a small amount of violence. It does put a great limit on any modern day material as the need to shock or kill seems to be inherent for the majority of movies and most television programmes. To me films such as Avatar would have been so much better without the excessive violence. I have always thought that watching too much violence or horror is not good for anyone, but most especially children. I remember being shocked (back in the mid eighties) when my five to six year old son told me that his friends at school were watching movies such as Nightmare On Elm Street. I could not understand how parents could allow their children to be subjected to such frightening images, it just didn't make any sense to me. Even then before I had heard about the Law of Attraction and the effects of negativity on people, it just seemed logical to me that if someone is viewing such things at a young age not only can it cause emotional problems, but as they grow older they will become de-sensitized and it will take more and more to interest and shock them. In the UK, it used to be that violence, swearing, horror and sexual scenes were never shown on television before the Watershed' of 9pm. (I think in the US this is called 'Safe Harbor.') But over the years there has been a dramatic change in what is seen as 'suitable for children' which makes it impossible for a parent to know if something they have not viewed before will be acceptable for their child to watch. Also, because they have been subjected to the steady but constant increase in lax censorship, their awareness and perception of the images that their children are watching are likely to be more liberal than previous generations. With the ever-increasing number of soaps on television and the demand to be at the top, storylines have to be ever more sensational to keep the viewers watching. So murder, excessive violence, dramatic incidents etc.. are all too common. In general, what is portrayed as acceptable and normal behaviour is: being angry, aggressive, abusive (verbally, physically, or emotionally), shouting, jealousy, greed, being secretive, promiscuous, having low morals, lack of trust & commitment & integrity & honesty and an overall view that life is high drama and mostly negative. Two more areas of downward spiraling morals and personal integrity are the ever-increasing amount of 'Reality TV' that is aimed at promoting negative behaviour and the use of sexual images in music videos. But I won't go into those now! When I write these blogs (which hasn't been much lately!) I usually don't know what I am going to write, but I ask for guidance and then begin. I started this page in January but as it seemed to have gone so far off from the quote 'As you awaken to your Divine nature' so I left it unfinished as I was unsure about it. Coming back to it today, I think it doesn't really matter that I went off on a negative angle because As you Awaken to your Divine nature you also let go of the negativity that you previously experienced and knowing ultimately we are all one you want to share with others. I believe that if even one person reading this considers the negative input from the media in their own or child's life, then the positive effect of me writing this outways the negativity of it. From the Law of Attraction point of view, it helps to know what you don't want (a life as portrayed in soaps) to then create the experience that you do want... a life of love, truth, joy and integrity. 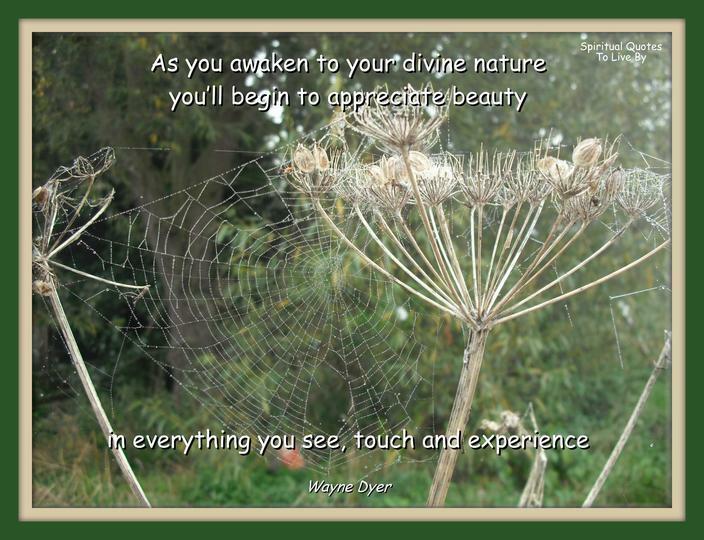 As you Awaken to your Divine nature you'll begin to appreciate beauty in everything you see, touch and experience; therefore all experiences, even negative, have their uses if we can learn from them and then move forward letting go and focusing on the positive, loving future that we are all capable of achieving. Next Blog: What Can You Do To Promote World Peace?